Chrichton's World: Review Regression (2015): Really had me going right from the start. 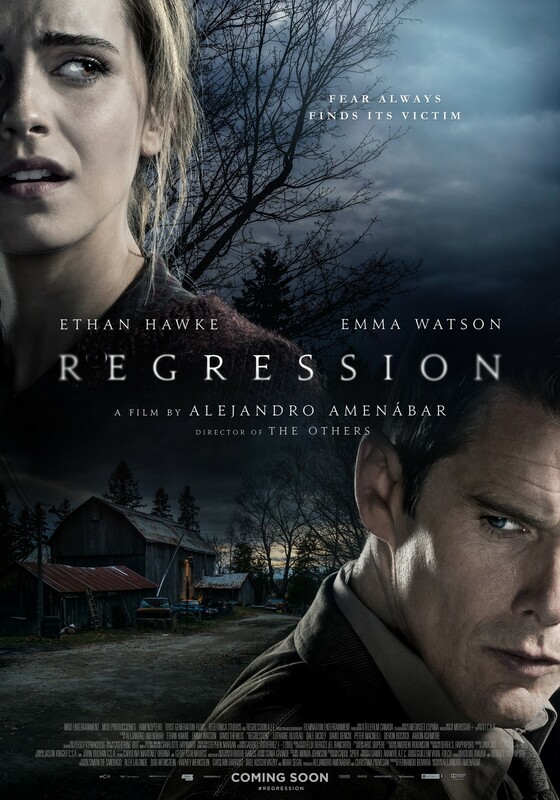 Review Regression (2015): Really had me going right from the start. Now this is my kind of film. It's creepy and chilling to the bone and yet it does not resort to cheap scares or thrills. Time is taken to build up suspense and once things start it will have you guessing till the end. Regression is one of those films the least you know the better it is. It's one where just the hint of something dark and sinister makes you imagine the worst things. Of course the audience is being manipulated like crazy. But if it has the result like with Regression then I am all for it. Director Alejandro Amenábar shows how much can be done with minimal means if you set the right mood and ambiance. And of course have a story that compels through and through. Ethan Hawke gives his character the right amount of intensity without losing the audience's sympathy. The same can't be said about Emma Watson. She was struggling with the American accent and it did not seem like she was entirely committed to the project. Luckily for us the little she gave was still good enough to not detract us from the viewing experience. One of the criticisms towards this film is that it rehashes old themes that have been done better. That could very well be true. Doesn't change the fact that even when you thought you had figured it out you could not be sure since it could have easily gone a lot of different directions. It is this doubt that I appreciate and am craving for. As a fan of the genre it is hard to genuinely surprise me. So if a director like Alejandro manages to keep you confused and in the dark (in a good way of course) until the conclusion then I can only applaud that. The conclusion might be a little anti climatic but it does add some food for thought if you are open for it. My advice is ignore the harsh criticisms. Have faith in Alejandro Amenábar who also directed The Others (with Nicole Kidman).